We report on high spatial resolution observations, using the Australia Telescope Compact Array (ATCA), of ground-state OH masers. 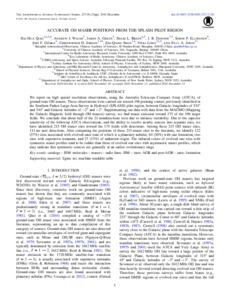 These observations were carried out toward 196 pointing centers previously identified in the Southern Parkes Large-Area Survey in Hydroxyl (SPLASH) pilot region, between Galactic longitudes of 334° and 344° and Galactic latitudes of −2° and +2°. Supplementing our data with data from the MAGMO (Mapping the Galactic Magnetic field through OH masers) survey, we find maser emission toward 175 of the 196 target fields. We conclude that about half of the 21 nondetections were due to intrinsic variability. Due to the superior sensitivity of the followup ATCA observations, and the ability to resolve nearby sources into separate sites, we have identified 215 OH maser sites toward the 175 fields with detections. Among these 215 OH maser sites, 111 are new detections. After comparing the positions of these 215 maser sites to the literature, we identify 122 (57%) sites associated with evolved stars (one of which is a planetary nebula), 64 (30%) with star formation, two sites with supernova remnants, and 27 (13%) of unknown origin. The infrared colors of evolved star sites with symmetric maser profiles tend to be redder than those of evolved star sites with asymmetric maser profiles, which may indicate that symmetric sources are generally at an earlier evolutionary stage.